For both versions of the hat, work Rnds 1-6. 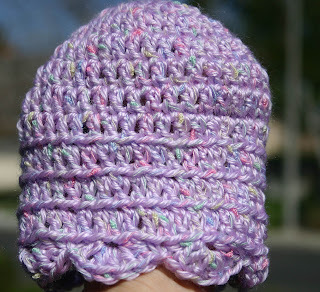 Continue straight through for the picot trimmed hat (pictured above) or skip down for the shell edged version (pictured below). Size: approx. 5" - 5.5" tall, and 5.25" - 5.75" across at the base. Picot: chain 3, slip stitch in vertical bar and side bar of single crochet before chain 3. Chain 3, then make 15 double crochet inside ring. 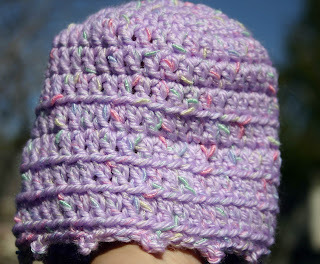 Join with slip stitch in top of beginning chain 3. Chain 3, double crochet in same stitch. Repeat from * around, ending with slip stitch in beginning chain 1. Fasten off. Repeat from * around, ending with 2 double crochet in same stitch as beginning chain 3. Fasten off. Copyright 2009 by Elisa Purnell. This document is free for personal use and may be shared and distributed so long as it remains fully intact including this copyright notice, and no profit is made from its distribution or use. The pattern is intended for personal, charity or humanitarian use only. A lot of time and effort goes into producing patterns, even when they are “free”. Please respect the copyright. Your pattern was just featured on Crochet Pattern of the Day; I have printed it for me to use to make for Lil Troopers. We are a group who make hats for babies born in military hospitals. It is a Yahoo Group, if you are interested in learning more about the group. I hope to make some hats for the Whole Hearts Foundation.